After traveling the world this summer, three Tarleton State University students, Gwen Telgenhoff, Trevor Braune and Adriana Rivas, were recognized for their entries in the study abroad photography contest. According to the Tarleton website, students were asked to submit a photo during their time abroad to showcase their knowledge in culture, customs, traditions, nature, city landscapes and student life abroad. Telgenhoff’s photo entry included zebras surrounding water, which was taken at the Chobe River in South Africa. Telgenhoff said that the motions of the animals inspired her to take the photo. 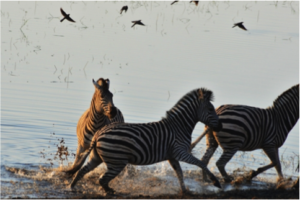 Gwen Telgenhoff won third place with her photo of zebras running at Chobe National Park in South Africa. Photo Courtesy of Gwen Telgenhoff. “I don’t know if something was bothering them, but you could kind’ve see it in their eyes the fact that they didn’t like what was going on. It’s almost like they would try and get the other [zebra] to leave as well. So it was kind’ve this communication between them which was really interesting,” Telgenhoff said. Braune was awarded second place for his submission photo, “Raining Days in Prague.” He took it from the top of Prague Astronomical Clock. 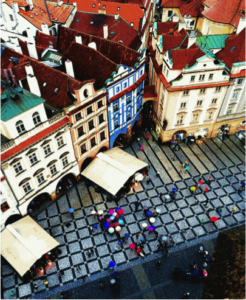 Trevor Braune won second place with his aerial shot of the old town square in Prague. Photo Courtesy of Trevor Braune. Braune added, “I do a lot of traveling around Texas and get to see so many amazing places and things, so what I enjoy about [photography] is getting to capture these amazing moments, so I will never forget them,” Braune said. “I was hoping to get a new outlook on life from this experience, and I did. It was amazing to experience how people live so differently and how much of a blessing it is to be an American where we have so many freedoms that other people will never have,” Braune said. Rivas, a sophomore, was awarded first place for her submission of herself holding a Tarleton flag in front of the Chimborazo Mountain in Ecuador. “Due to its elevation, the mountain is actually higher and closer to the sun than the tallest peak in Mount Everest. It’s my favorite picture ever too, and I have it framed in my room,” Rivas said. 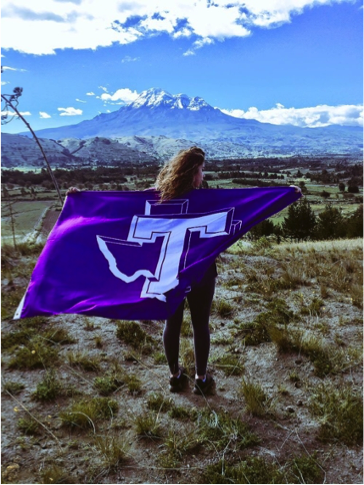 Adriana Rivas won’t first place for her photo of herself holding the Tarleton flag in front of the Chimborazo Mountain in Ecuador. Photo Courtesy of Adriana Rivas. “I took the Tarleton flag with me the whole trip. We had taken pictures as a group holding the flag, but I saw a beautiful view, and I didn’t want to be just standing there in front of the mountain by myself. I figured why not show the world where all Tarleton can go and what Tarleton can do,” Rivas said. “I was actually walking around, looking at everyone’s pictures and I was thinking to myself, ‘My pictures do not have a chance against all of these. I don’t even know why I try.’” Rivas said. Rivas is an international business major and she said that she loved the trip and it “was reassuring to know that what I’m studying for really is what I want to do.” She recommends anyone interested in studying abroad to go. “I would definitely recommend anyone who is able to study abroad to go and to not let financial reasons be the reason for you not to go because there is help out there. I feel like if you don’t enjoy the moments you have right now while you’re young, you won’t experience them later on in life because other priorities are going to come before you,” Rivas said.